And really good news for Brits (jealousy seeps into post), BBC radio will be doing doing a six-parter version which better show up on iTunes damn quick. I’m already upset I can’t get the Suzy Bakes pink Victoria sponge tin over here, and now you have this. Plus your chocolate is miles better than ours. If anybody over there will be listening to this while eating Maltesers and baking Suzy’s sponge, I DON’T WANT TO HEAR ABOUT IT. Next > Too Much Stuff? “BBC radio shows stream for free worldwide from their website.” Copied from a comments to the Toybox link. There’s a clip up already; Neil and Terry’s cameo. Yep, it’s in the post I linked to. So much fun. What is it about the Brits that give me slightly anglophile feelings? They’re smart, funny, and nice to look at? Although I may be basing that on Strop. Except for David Cameron. He should be exiled to the Outer Hebrides, although that wouldn’t be fair to those poor Hebridians. Thanks baby. I spent today with another awesome Cherry Brit, Jackie; we went shopping, had lunch in a pub which you would absolutely love, and then went to the ice cream parlour for pudding before doing more shopping. They released the Neverwhere adaptation on Audible (and it’s quite good) so I would assume they mean to do the same with this one. Yep, it is on Audible and finger is twitching to spend a credit…. I love the Neverwhere BBC radio play! Good Omens is one of my all-time favorite books. I re-read it every couple of years and wish I was that clever. Mmmmm, Maltesers. I’m gonna get some when I go back to work. The funny thing about Good Omens is that I have read/listened to it about four times and every time I have no idea what it’s about. It totally slips out of my memory every time. Satan sends the Anti-Christ to be born on earth. Babies gets switched because of incompetent Satan-worshipping nurses. The Anti-Christ grows up the son of a no-nonsense farmer in rural England. When the Antichrist turns twelve, it’s time for the Apocalypse. A witch named Anathema comes to stop it along with an angel and a demon who have spent centuries on earth and are kind of against it all ending. The four horsemen of the apocalypse ride. Also that was mean about the Maltesers, except I just ordered a whack of them for Christmas gifts. Some even for other people. I KNEW I’d screw something up since I didn’t check the details. Thank you for catching that. I grew up eating Maltesers. Now I want some. Oh, and Gamain and Pratchett were discussed at length over our turkey yesterday. I had no idea my kids friends were such fans. Fun conversation. They also told me I should watch Gotham. (They said first couple of episodes aren’t great, but it’s now terrific.) Have you been watching? Is it really any good? Anyone? The lead is the Good Guy so he’s bland. His girlfriend is Gotham’s Laurel; you just want her to go somewhere else. The premise is a kneecapper: This is Gotham while Bruce Wayne is a boy, so you know the city is going to hell no matter how hard Jim Gordon (Good Guy) tries. Having said that, the supporting cast is so amazing that you should watch it. Donal Logue is terrific, Sean Pertwee is terrific, Jada Pinkett Smith is chewing the scenery with so much passion she’s unstoppable (and her scene in the last episode with Sean Pertwee’s Alfred is a masterpiece of sexual tension), and then there’s Robin Lord Taylor as Cobblepot before he becomes the Penguin and who should be the lead character as far as I’m concerned although I’d watch a show about Alfred, too. Oh, and the little girl who plays Before-She-Was-Poison-Ivy had about a sixty-second bit in the last one and stole the show. I’d watch her show, too. Good news: Barbara went back to her lesbian lover, so maybe she’ll stay there. If her lesbian lover was Laurel Lance, I might even watch Arrow again. Sean Pertwee! I’ll watch anything with Sean Pertwee in it (although there have been a few times when his choice of role/ film has had me hiding behind my fingers). Not just me that has problems with Arrow then? Good. How can characters be so dull? I haven’t even tried Gotham – even the concept bored me. It was so, so good for awhile. Weak start, and then it really hit the ground running. And then it pancaked. Guess what I’m reading on Black Friday? The Bet. And I can’t bear to put it down, but these people around me keep shouting to be fed. It’s SO annoying. I’m READING! Just went out and purchased a Kindle copy, based on your recommendation and it turns out part of the profit will go to my local library, so how great is that? Oh, excellent. You’re going to love it. It’s available on Amazon UK, not USA, and they won’t ship it to the US. I’d need to find an outlet here, and there must be one because I got the blue scone box at Home Goods last year, not realizing what I had. But Google let me down; the only outlets were in the UK and they won’t ship. It’s okay, I’m diabetic, I need the sponge like I need a sugar coma. And the Maltesers are on their way. I blame Strop for that; she send me some once and I lost my mind. I would never have known about them if not for her . . .
Yaaay for Hotel Chocolat! I’ll bring some when I make it to the Minnesota State Fair. Probably in 2016. I’m envious of Australians who can already get Sarah-Kate Lynch’s latest book, Heavenly Hirani’s School of Laughing Yoga. We can’t get it until sometime next year, early I think. I keep trying to read Pratchett and I just don’t get it. I feel like there might be something wrong with me considering all the people I like and admire who love him. But if I start to read him, I will quickly get disinterested and put it down and wander away. I know, I know, please don’t block me. You’re not alone. I tried ‘Good Omens’ last time Jenny raved about it, and didn’t get past the first chapter. We’re like Venn diagrams on Argh, I think: our tastes only overlap partially. I have picked up some good authors here, but also many duds. Thank goodness for Kindle’s sample pages. PS. I am planning to give the new BBC adaptation a go at Christmas, though – I don’t want to shatter Jenny’s illusion that we’re all smart. It’s got nothing to do with smart. I think it’s a sense of humor thing. Different people, different tastes. Argh: We’re eclectic. LOL. YOU DON’T LIKE PRATCHETT??? Never darken my blog again. “No.” I’ll accept Huckleberry Finn, though. The thing with Pratchett is that he has evolved very much as an author over time (and so have his characters and even his settings). This makes some of the earlier stuff, harder to get into and some of the later (and in my opinion deeper and more thoughtful) works a little dependent on knowing the characters. I know there is no such thing as universal tastes but Pratchett is probably worth sampling from multiple entry points as there is a definite chance that you will find something to your taste. I’ve just downloaded a new sample: thanks, Annamal. I do enjoy Terry Pratchett as a speaker, so I thought I would enjoy his writing. Absolutely. He’s been writing a long time and his writing changed, as will happen with any good author. He’s always interesting, though, even when he misses. Have you read Slip of a Typewriter? It’s a book of his collected speeches, articles, etc. I borrowed it from my library and I think it’s going on my Kindle Wish List for Christmas. But somewhere in there he specifically states that he does not recommend reading the series in order. No, but I went to look for it, and Google doesn’t recognize it. Argh. I found this on Amazon with the title A Slip of the Keyboard : collected nonfiction. Published 9/23/2014, hardcover, list price 26.95. Request your library to purchase same, if they don’t have it in the collection, or on order. Dear Jenny, I have been reading Pratchett and really really like the Sam Vine ones BUT I seem to be missing one or two. In what book did he arrest Vetinari? When was he made a Duke? I like the Moist ones as well, just finished reading Raising Steam, really really good it had all my favourite people. If you read Guards, Guards (and you should, it’s the first Vimes), he meets a nice dragon-rescuing Duchess, which is how he becomes a Duke, much to his surprise. Vimes arrests Vetinari in The Truth, another outstanding book, this one about Ankh Morpork’s first newspaper. And now I must go read some Pratchett. No, no, I have to work. THEN I’ll read some Pratchett. Loved the guards books, named one of my cats after a character from them. I basically read just Guards books and not other Discworld and I’m fine. The series sort of has sub-series like the Witches, the Wizards, Moist, etc. Seriously? You’ve never read a book with Susan in it? You’ve never read Thief of Time? Going Postal? Those are the two best books he’s written, after Good Omens, of course. I tried reading all the Discworld stuff in order but nothing was as good as the Guards stuff to me. I did read Going Postal and was kind of “meh” on Moist. Sacrilegious I know. I tried the Rincewind stuff and just *shudder*. I liked some of the witches books but not all. I generally handed people Reaper Man and backed waaay off, in part because it took me a couple years of people insisting I’d LOVE them if I gave them a chance, and I was not loving them. And then suddenly I WAS loving them, and got annoyingly pushy about it. I can’t remember whether I read Feet of Clay or Small Gods first, and the books are so different I may have discovered him twice. I know Small Gods was an airport buy. But after Feet of Clay, I went out and found the rest of the Watch books because VIMES and also CARROT not to mention ANGUA, so I had to. And after that . . . Pratchett is a slippery slope. This was intended as a reply to @Beth Matthews. Pratchett worked hard to keep Vimes out of the Moist books because, as he’s said, when he introduces the Watch they tend to take over. Because, as was said, VIMES. CARROT. ANGUA. And Nobby. I believe he became a commander in the first book or maybe the second book. He did not become a duke for several books when he did something and Ventinari wanted to annoy him. He was made a duke at the end of Jingo. Whoops. My mistake. Thanks for the fix! The best thing about living in SA is that we get almost anything from anywhere if you just try and work it a bit. I grew up on American, British, German and Australian tv. Every Sunday there’d be specialist Indian, Portuguese and Greek tv for about 2 hours each on the Public broadcaster channels. We had mainly English (UK and US) and Hindi and Tamil Indian film, though most of it was the mainstream stuff. A lot of stuff released in the US would go straight to video here. With short-wave option on the radio you could (and still can) get the Beeb, Indian, Chinese and many other radio stations. Most English stuff could be found somewhere because of post-colonial links and TimTams came from the emigrants. We skipped cable and went straight to Satellite tv. I am very grateful for it all. And you guys raise some good stuff too — I just discovered the wonderful South African, Trevor Noah. He’s so nice! And his accents are pretty darn amazing! Micki, we DO, I think it is because we have such a view of the world. A global view, if you will, that the rest of the world don’t have of us. As for Trevor Noah, saw him live last September, what a laugh-riot! Also, many of us are multilingual and if not fluent in a language, we can speak basic words and phrases. When people speak accented english it makes us all listen harder, so accent play is quite common and not considered a discriminatory act. Hey there. I can get the tin from here in the UK and send it over there to somewhere of your choice?? Is that allowed?! No, no, that wasn’t a hint. It was me being whiny. It’s lovely of you to offer, it really is, but I was just being a brat. An now I will never be able to read that scene in GO without picturing Pratchett and Gaiman in those roles. And I shall look forward to the adaption. I hope it works like the other BBC programs and allows me to download like the podcasts do. (-: This is good news. More Gaiman! More Pratchett! I look forward to figuring out how to stream it off the BBC. Amusingly, we’re listening to the Light Fantastic on our travels this weekend. 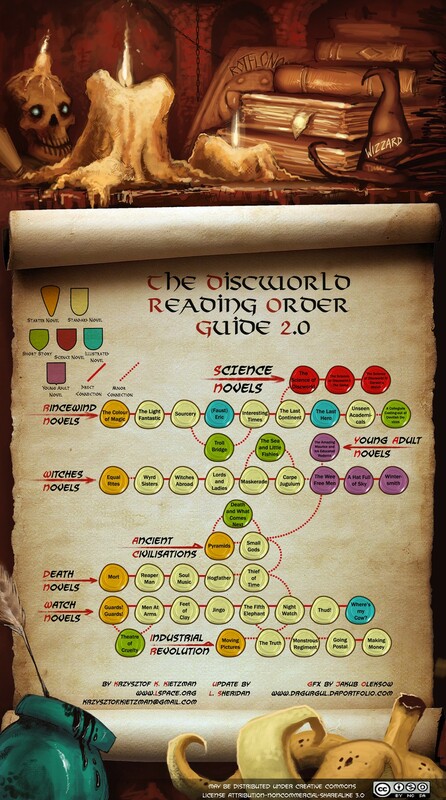 I know there are sub series in Discworld, but I still have a need to “read” the books “in order.” (I’ll likely read it based on publishing date but have used http://www.lspace.org/books/reading-order-guides/the-discworld-reading-order-guide-20.jpg as a guide too.) Discworld series will get us through years, if not decades, of traveling to the relatives for the holidays. It does seem like Good Omens isn’t a part of Discworld, but a stand alone, so that could get bumped up to the next book. Good Omens isn’t part of Discworld. that tells you what books are in what sub-series, so you can start with Guards, Guards, which is excellent, and that’ll get you the Watch (police) series. I’d skip the Rincewinds entirely; I’ve never been able to get through them. You’re pretty safe with the Watch books, the Death books, and the Post Office/Moist Van Lipwig books, although Making Money wasn’t as brilliant as Going Postal. Going Postal is one of the best books I’ve ever read, and that’s after re-reading it half a dozen times and still being delighted by it. The Light Fantastic is not great. Do not base your opinion of Pratchett on that. And while you’re at it, don’t base your opinion of me on Sizzle. We all have to start somewhere, but we don’t have to go back there. Wyrd Sisters is good stuff, though. I want to be Granny Weatherwax when I grow up. The first Pratchett I read was “The Colour of Magic” as a fantasy novel for my adult pop lit class. Also for that class, I read “Bet Me” – the first book of yours I read – for one of the 3 romance novels I was required to read for the class. It was a wonderful class. I did my book talk on Bet Me and I didn’t try Pratchett again for 8 years because I found his book confusing. Your books, on the other hand, I devoured and didn’t get to Sizzle for a few years because it was quite expensive on Amazon. The benefit with your books was that they were stand alones, mostly, so I could easily read the new ones first. I have a minor complusion to read series in order. Ok, maybe not so minor. So, I’ll work my way thru. I am finding that I like the audio versions better. Plus I’m listening to them with the hubs as we travel so sometimes it makes for fun banter between us. The one thing that The Colour of Magic gave us was Luggage! I love Luggage. Equal Rites is up next for me. Oh, the Luggage is the one of the greatest characters in literature, absolutely. It’s Rincewind I can’t stand. Steady on. What’s wrong with poor old Rincewind? LilyC, I can see what’s wrong with Rincewind, but I do adore him anyway. Just some poor schlub, trying to stay alive in very trying circumstances. And he is kind to orangutans, in a totally non-condescending way. Agreed. Rincewind isn’t a strong character. Quite whiny in fact, but he’s grown on me, like moss. My two favorite books are Night Watch and Feet of Clay. I have never been able to get into Neil Gaiman, so I haven’t read Good Omens but I will give it a whirl over the Christmas holidays. Oh, that’s lovely. Thank you for the link! Neil Gaiman is kind of an odd duck because all of his books are VERY different from each other. I’d say if you like Pratchett probably the closest Gaiman book in tone and funniness would be Anansi’s Boys. (It shares characters with American Gods but you don’t have to read AG to understand Anansi’s Boys. And they are VERY different books tone-wise.) Stardust is another of the more light-hearted Gaiman’s. was outstanding. Some of his short stories are also amazing. I loved Sandman… and the artwork of the illustrations was always a treat too. I find most of Gaiman’s writing to be too dark for me, but not all. He writes truly excellent short stories, and his contribution to A Study In Sherlock is still a favorite. But the interesting thing about Good Omens is the balance that is struck between the two writing styles. That alone is pretty amazing. You can tell which writer “owns” which main character, but they blended beautifully. So you get a book that has more depth than most of Pratchett’s books, but also more whimsy than you find in Gaiman. And I think that’s really what makes it such a perfect read. I still haven’t gotten through the last level–I wandered off–but now I must. Hi Jenny, The last level is tricksier than normal No spoilers, but remember that Ida and the Totem can move on any surface. There’s one part of the new level that is absolutely boggling, especially for a quilt maker…..hexagons. Wonderful, tricky hexagons, heaven. We can only grieve that there won’t be more Monument Valley but the makers are touting a new game that will come out this Spring. Maybe it will be as good. Is that the white lines in the air? That one I got. I gave up on the last level last night because I was tired, but today, I will conquer all. Or look for cheat codes. It’s such a beautiful game. It’s fascinating the way people can look at the same thing and not see the same thing. I didn’t see the white lines, I saw the shapes the lines outline and how they changed as the image revolved. I went back and tried to solve it by paying attention to the lines and it was much easier. It’s the second puzzle, the one with the red block building that really baffles me. I’ve tried it twice now and solved it both times but it wasn’t a pretty. I’m still on the last level, with the windmills. I loved the white lines. So different. I just love all of Monument Valley. Dear Jenny, And everyone else, thanks for the tips. I will now order The Truth from the library. I was able to buy a few of the Watch books, but he is very popular in my part of Canada, so it is rare to find them. 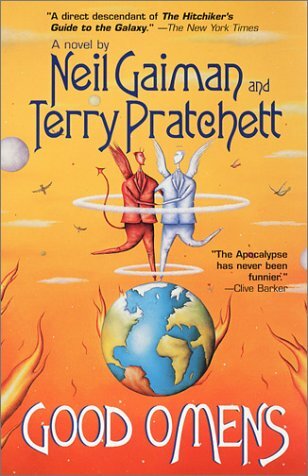 My first Pratchett was Equal Rites, because I liked the blurb about a girl wizard. I bought it when it was first published, then went back and read Colour of Magic and Light Fantastic, and have been reading them all, both as they were published and any time I felt like it, ever since. I was very happy when Esk reappeared in I Shall Wear Midnight. Having said that, I am currently deeply engrossed in Ben Aaronovitch’s River of London books. No.5, Foxglove Summer, came out a couple of weeks ago. I bought it straight away, read it in a few hours, took a day off then read it again. Now I’m reading them all from the beginning. Love that series. I scorn Maltesers since I discovered Hotel Chocolat, especially HC bargain boxes. However I still love Malteser cake. I fell in love with the Ben Aaronovitch books, after reading about them here. A new one, eh? Merry Christmas to me!! The new Aaronovitch is out? Off to Kindle. I do not want to know about Hotel Chocolat since it’s already difficult to get Maltesers. And I’ve seen pictures of your Malteser cakes. That’s just mean to mention them. ARGH. It’s out in Britain, not here. We can’t get it until January. First the sponge and the Maltesers and the BBC, now this. This is payback for that whole colonial rebellion, isn’t it? Would you like me to post you a copy? Get thee behind me, Strop. I’m diabetic, I’m not supposed to have that stuff. Although I will be eating the Maltesers . . .
Really, you already sent me buttons. You’ve done enough (g). Nope, I’ll wait until January and get it for the Kindle, but thank you very much. I’m still gloating over the buttons you sent me. I have a button thing and they’re fabulous. Jenny – I went to Kindle store to check Ben Aaronovitch out & I was able to order Foxglove Summer from Amazon USA. I can order it, but it won’t arrive in my iPad until January. I’m so excited for Foxglove Summer. The ending of the last one. Yeesh. So glad others here year Aaronovitch. I don’t know about Maltesers, but I’m partial to chocolate-covered McVities Digestives. I like the dark chocolate digestives with a bit of Stilton. Weird but good. I like to stuff green olives with Stilton, put about 6 in a glass then cover it with a martini. Then I eat them one at a time with the occasional martini sip. When I run out of olives, I add more and continue doing this until the martini is gone. That is pure genius. Thank you. I like the Cabury’s version of Swiss rolls (I can’t remember what they are called). I had a fight in the parking lot of ASDA over them. And I won. And it was worth it! I’m really glad I discovered BBC’s radio dramas a couple of years ago. The Drama of the Week is a podcast I download regularly for listening to at work. (Work only involves about a half-dozen brain cells, so I listen to a lot of podcasts and audiobooks there.) And the WWI-based series TOMMIES and HOME FRONT are also good. Have never, never commented on a blog before!! And, this blog was so absolutely fascinating that I had to say THANK YOU for putting spark into my day. And I have already ordered the audiobook Neverwhere based on the comments. Plus, I do love all things Brit. Am trying to think of ways to live and work on the other side of the Atlantic. 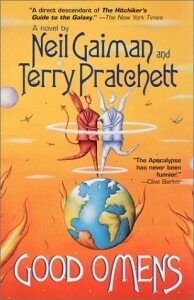 I refused to read Terry Pratchett because I hated the covers of the early books – and yes I know they are satirical. My local SF bookstore recommended I try Small Gods. After finishing it I bought the rest over the next few months as the budget allowed. I’m not fond of Rincewind – my least favorites. The Vimes books are my favorites. Thud and Night Watch are extraordinary. Re happy chocolate events. We have Maltesers in Canada (though not with the better British chocolate). For long lasting pleasure – freeze them. My local British food store also has McVitie’s Dark Chocolate Hob Nobs. Major yum. BTW – I survived a traumatic move last year with Crusie re-reads. Bet Me is so damn good. Thanks! You’re welcome. And so glad you gave Pratchett another chance (those early covers were awful). PS – I bought my copy of Foxglove Summer from Waterstones and got an extra chapter/ short story at the end called ‘The Loneliness of the Long Distance Granny’. Don’t know how you can get that on the Kindle. If you did really lust after the cake tin thing, I could arrange it, being in UK. But you don’t know if I’m weird or a stalker. I’m actually not, but I would say that if I was! But I may come back to you if I find myself compelled to acquire that pink rectangular tin. They’re so cheerful! The sponge would be good, too. Nancy C on Questionable: How Do You Start a Book?